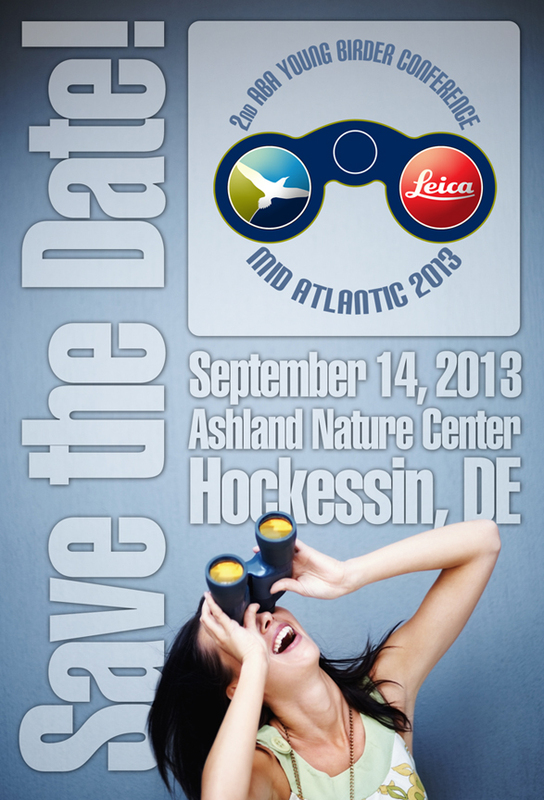 Save the Date for the 2013 ABA Young Birder Conference! Save the Date for the 2nd Young Birder Conference, returning this September to Hockessin, Delaware! Easily one of our must successful events in recent memory, the Mid-Atlantic Young Birder Conference held last fall in Hockessin, Delaware, was a ton of fun for those involved, ABA staff and young birders alike. We were joined by 140 young birders, along with a who's who of speakers and friends including 2012 ABA Young Birder of the Year Marie McGee, Birdwatcher's Digest editor Bill Thompson III, and Leica Optics rep Jeff Bouton, all of whom came away talking about how inspiring it was to be among so many skilled young naturalists and birders. We're really excited to be able to build on that success, and we're ready to announce the second edition of the Young Birder Conference, to be held once again at Ashland Nature Center in Hockessin, Delaware, on September 14, 2013. We hope to see old friends again and to welcome those new birders excited for the opportunity to bird among peers. More information will be coming soon as we continue to nail down specifics, but get that date on the calendar! Contact Bill Stewart at bstewart AT aba.org for more information.